Tessa Longbons | October 19, 2017. 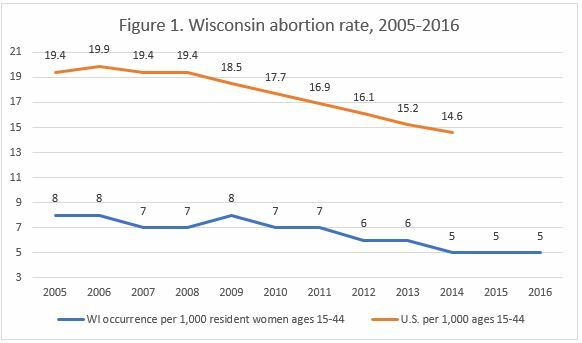 Wisconsin’s 2016 abortion report reveals that the abortion rate in the state is maintaining its slow but steady decline (Fig. 1). Published annually by the state’s Department of Health Services, the 24-page report includes information on all the abortions occurring in the state and on abortions performed on Wisconsin residents specifically. The report is normally released each August, although the 2016 report was published a week ahead of schedule in July 2017. *Information on Planned Parenthood’s Wisconsin market share is not publicly available. The annual number of Wisconsin abortions has been decreasing since 1987, when 17,318 abortions were performed in the state. By 2016, the number had fallen to 5,612 total abortions, a decline of 68 percent. Since 2005, Wisconsin resident abortions have decreased by 43 percent. At the same time, the percentage of chemical abortions has increased (Fig. 2). 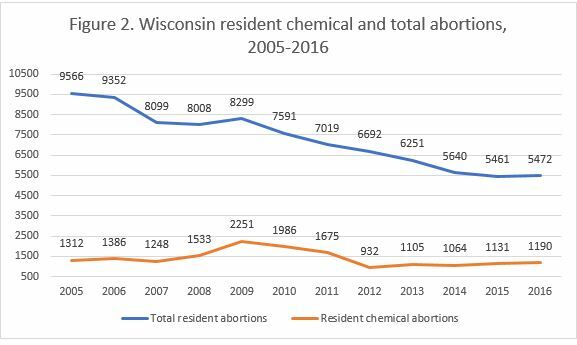 In 2005, chemical abortions made up 15 percent of Wisconsin’s resident abortions, while in 2016, chemical abortions were 22 percent of resident abortions. Wisconsin’s 2016 abortion rate was 5 abortions per 1,000 resident women aged 15 to 44, the same as 2015 but lower than previous years (Fig. 1). Of the 5,612 abortions that occurred in Wisconsin in 2016, there were 5,472, or 98 percent, performed on Wisconsin residents. The majority of Wisconsin residents who underwent abortions in 2016 were young and single. Fifty-eight percent were in their twenties, and 78 percent had never been married. White women composed the largest racial category, accounting for 54 percent of Wisconsin resident abortions. Most Wisconsin women who had an abortion graduated from high school but not from college, with 70 percent having completed 12 to 15 years of education. Fifty-six percent of the abortions performed on Wisconsin residents in 2016 occurred at 8 weeks of gestation or earlier. Thirty-seven abortions were performed after 20 weeks of gestation, although Wisconsin’s report acknowledges that statistics on gestational age are imprecise. Wisconsin prohibits abortions after 20 weeks post-fertilization or approximately 22 weeks of gestation. In 2015, the year the 20-week law went into effect, 54 abortions were performed on Wisconsin residents after 20 weeks of gestation. Wisconsin law requires unemancipated girls under the age of 18 to receive consent from a parent, legal guardian, or adult family member before undergoing an abortion. In 2016, 193 abortions were performed on Wisconsin minors. Eight of the girls obtained court orders allowing them to procure abortions without parental consent. Wisconsin allows exceptions to the adult consent requirement without a court order if there is a medical emergency, if the girl is a victim of sexual assault or abuse, or if the girl is likely to commit suicide. However, no such exceptions were reported for 2016. Wisconsin is one of 26 states to require parental consent to an abortion, but only seven state reports provide information on the abortions performed under these laws. In 2016, the Charlotte Lozier Institute conducted a study on state abortion reporting across the 50 states, ranking Wisconsin at 17th best. Wisconsin’s reporting is largely transparent and consistent, with the state reporting much of the data it collects. However, Wisconsin fails to report whether ultrasounds were performed or medical emergencies existed, even though it collects this information on its official state abortion reporting form. Additionally, Wisconsin does not collect data regarding women’s previous pregnancies and reasons for abortion or the specialties of abortion providers and facilities – data points reported by several other states. By including this information, Wisconsin could provide a better picture of where and why abortions occur and offer deeper insights into the changing abortion rate in the state. Figure 2 displays the annual number of in-state resident abortions. Wisconsin does not report all in-state abortions by type of procedure.